This article was originally posted on devex.com. As Brazilian President Michel Temer fought for his political life over the past three months, he sought support from powerful interests to keep from being impeached. His efforts paid off: On August 2, Brazil’s Chamber of Deputies voted against having Temer stand trial for corruption in the country’s Supreme Court. But this victory for the president brought a threat to his nation’s indigenous peoples and to Brazil’s climate commitments under the Paris Agreement. The threat took the form of a legal opinion issued in mid-July by Brazil’s Office of the Attorney General. It directs federal government agencies to freeze all indigenous land demarcation cases where the area was not occupied before October 1988, when the federal constitution was enacted. The act has the potential to halt over 700 pending cases of tribal lands demarcation, the process by which people apply for legal rights over the land where they live ― a violation of indigenous peoples’ constitutional rights to permanent and exclusive use of their territories. Without legal protection, these areas are likely to be quickly deforested, releasing tons of stored carbon dioxide into the atmosphere and contributing to global warming. Groups such as the Brazilian Articulation of Indigenous Peoples (Articulação Brasileira de Povos Indígenas) and the Climate Observatory (Observatório do Clima) view the attorney general’s action as the result of pressure by the rural caucus in Congress, which represents cattle ranchers and lumber companies. The caucus has been pushing hard to undermine environmental protection programs and policies that combat climate change. The result is likely to benefit cattle and lumber interests, which have a record of moving into preserved land and promoting unsustainable agricultural practices. The legal opinion that puts the demarcation process on hold is seen as payback for rural caucus members, who voted to keep Temer in office. There’s already evidence of what could happen if these interests prevail. Last month, Temer abolished an Amazonian reserve the size of Denmark called Renca, and efforts are currently underway in Congress to remove protections for other parts of the Amazonian ecosystem and diminish indigenous rights, sustainable forestry and land use. The ruling would put approximately 30 percent of the reserve in danger of losing its forests. After the negative repercussion of the measure, the government took a step back. It responded to the environmental outcry by suspending the decision and by opening the subject for public discussion. Such changes would hinder Brazil’s ability to meet its Paris agreement goals, since lands where indigenous people and local communities are located account for 23 percent of the total carbon stored above ground in Brazil. Beyond serving as forest guardians, these people and communities practice sustainable land management because they rely on nature for their homes, sustenance and livelihoods. 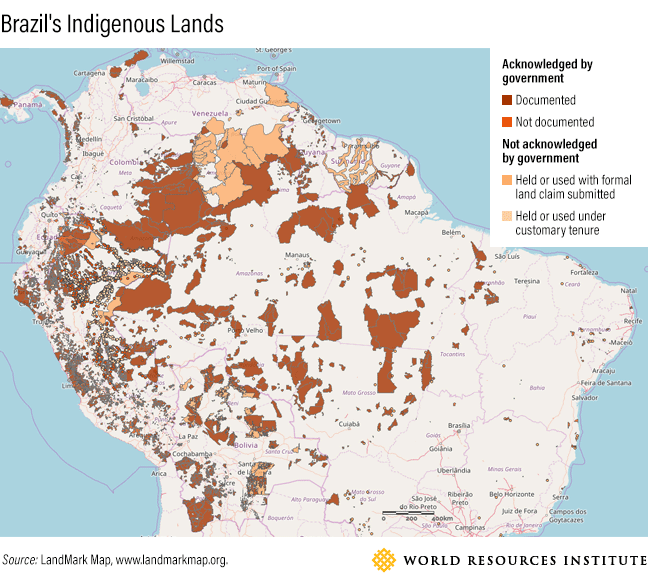 WRI research shows that deforestation rates are twice or three times lower in forests legally managed by indigenous peoples and communities than in other forests. The legal opinion has immediate practical consequences. It prevents federal government agents from moving ahead in the recognition of indigenous land rights. Jurists who have fought hard to include an indigenous peoples protection chapter in the Brazilian Federal Constitution in 1988 consider the legal opinion unconstitutional and a violation of Brazil’s obligations under international conventions. Civil society movements, indigenous organizations, jurists and the federal prosecutor’s office have all resisted the legal opinion, which they consider authoritarian and regressive. The government measure adds more fire to Brazil’s political crisis, which has been marked by continuous efforts by the rural caucus in Congress to reduce protected areas in Amazonia and limit environmental legal protection in other rural regions. Brazil depends on sustainable agriculture to compete in the new climate economy, where environmental sustainability is essential. 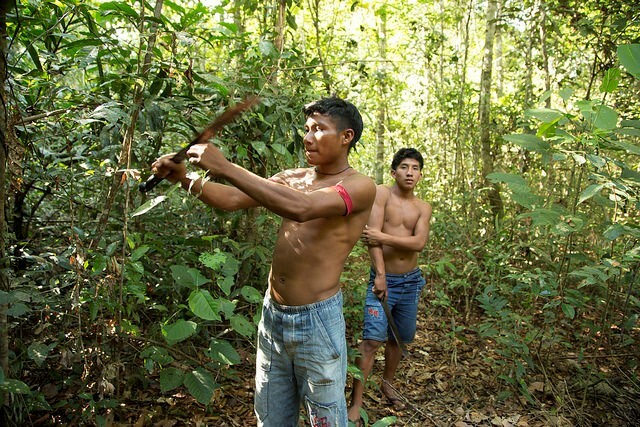 If Brazil does not promote equitable access to land for the rural poor or address indigenous and traditional peoples’ land rights, it will struggle to meet its sustainable development and low-carbon goals. In addition, increasing rural conflicts would make investors less likely to go to Brazil as a prime source for food, animal feed, fuel and fiber. The vote that kept Temer in power and the land rights opinion suggest that climate denial is on the rise in Brazil. But this is not the end of the story. Indigenous peoples and communities are doing more than saving their own lives and livelihoods. By protecting parts of Amazonia, they have the power to help save our lives from climate change impacts, too.